"Your website is the best! Thank you for all of the ideas!" This section of our gallery is dedicated to Blanket Cakes. A special thanks to all of our readers who sent in their photos to share it with us! Click on the index link below to browse other categories. 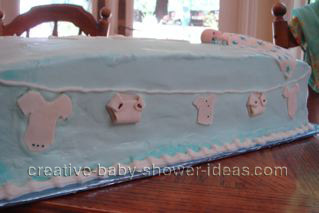 Bake one 11x15 white cake and 4 cupcakes. Frost cake with white buttercream decorators frosting and pipe chocolate buttercream frosting onto the cupcakes using a star tip. 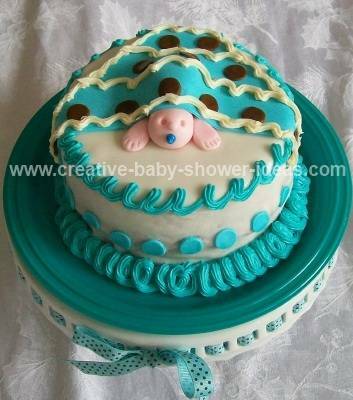 Create box borders on cake by piping white shells in rows and columns across the cake. Pipe white shells on the top edge and bottom edge border as well. Write WELCOME across the top boxes and BABY in the center boxes using a star tip. Alternately through the rest of the boxes pipe baby booties, baby rattles, umbrellas, and safety pins. Create ribbons on the baby rattles, umbrellas and baby booties using a #2 tip. 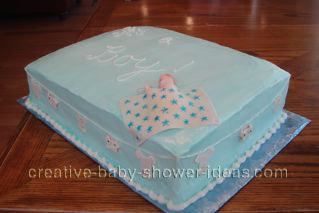 Using a small star tip -- create dots along the bottom shell border using all the colors used in the cake. This was my first cake I ever decorated after my first decorating class!! 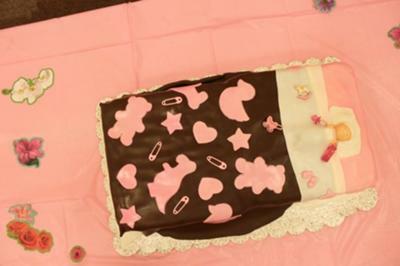 It was for a co-workers baby shower she was attending -- and everyone just loved the cake! I was able to use all the techniques I had learned on this one cake. Even though I was very nervous about it being my first cake - I think it turned out great! This cake was for my best friend/ son's godmother. The clothes on the clothesline are gum paste we found that they were lighter as we could make them thinner and they didn't crack as much, I still have a lot to learn about fondant, I went to art school, not culinary but I am totally into baking arts right now. 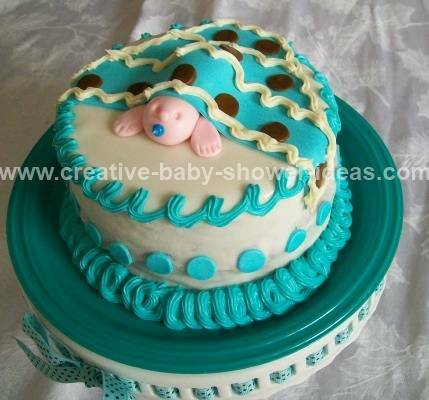 I did learn to test food coloring and buy a couple of selections, we had to re-frost the morning of the shower to turn it into a baby boy cake rather than an under the sea cake, but aside from having thick frosting it came out cute. Baked, filled, chilled & crumb coated then chilled again overnight. 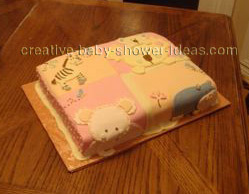 Decorated in the pattern of the crib bedding, all animals are cut from fondant (purchased white, mixed colors as close as I could). Animals were a little big so rather than re-cutting I modified my plan- so my advice is simply to measure!! 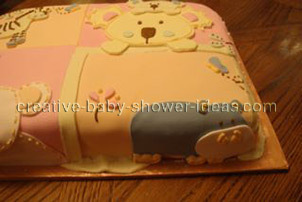 - I used the fondant to make the bedding quilt, in the back I just used buttercream ( I have a 5 month old and it was my birthday so time was of the essence and coloring frosting is much easier than coloring fondant ) I used some royal icing for glue and filler, as well as frosted detail, eyes, dots, manes, stitching. As I was finishing I felt like the cake to independent from the cake board so I added a fondant ruffle. I hope you like the cake, my sister-in -law did which is all I could ask. Prepare a basic white cake batter (I use whatever basic cake mix is on sale at the grocery store!). I used eight mixes for this particular cake, but you can adapt the recipe to the number of servings you need. While the batter is still mixing in the electric mixer, pour in a considerable amount of mini chocolate chips. I find that hitting the bags with a small hammer eliminates large clumps of chips and creates a chocolate-y dust that flavors the cake. I use approximately half to three quarters of a bag of chocolate chips per cake mix. 3. Line your pans with parchment paper and sprinkle extra chocolate chips in the bottoms. I used two deep dish lasagna pans and cut out my squares, but you could use any pans that stack in nice tiers. Pour in the batter evenly. Sprinkle extra chocolate chips on top. The cakes will take fairly long to bake, if you make them as large as I do. Allow cakes to cool, remove the top bumpy layer of cake and torte each tier once in half. I used my own homemade buttercream icing, according to the Wilton recipe. I find it is not only delicious, but just the right consistency. Ice in between the halves of cake, and assemble tiers. Spread a complete layer of icing all over the entire cake. I find the more icing you use, the better the cake is. Now it's time for the fondant work. 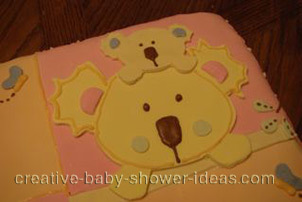 I used several packages of the pastel colors from Wilton and white. Roll out the fondant in sheets on parchment paper. Use a square cookie cutter to cut out many different squares of each color. 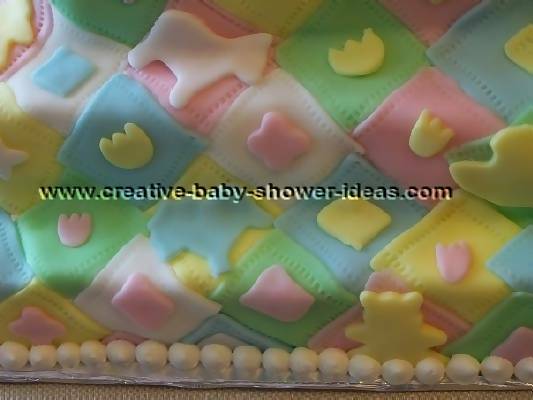 I used a fondant press to roll a line that looked like stitching around the four sides of each square. You will need tons of squares! 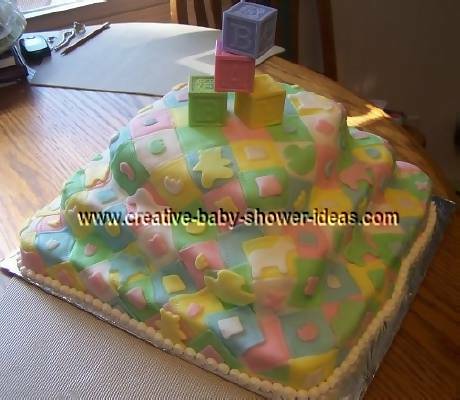 Start on the top tier, and begin placing the squares on the icing. Line them up in diamond patterns like a quilt. Try not to put the same colors next to each other. Use a fondant smoother to maintain the lines of the tiers. 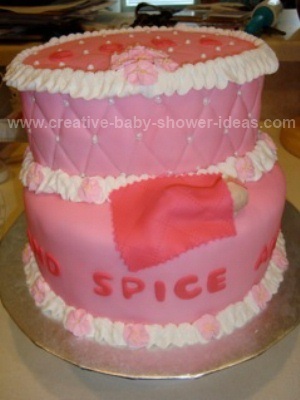 Cover the entire cake in these squares so that no icing is visible. 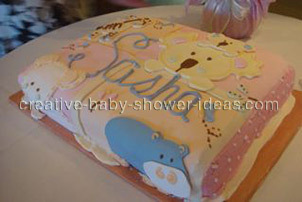 You want to use freshly cut fondant, so it is pliable over the cake. Now, re-roll the pastel fondants. Use cookie cutters to press out small shapes that become the designs on each patch of the quilt. I used mini cookie cutters of Noah's Ark animals, small shapes like diamonds and hearts, and flowers. Use a paintbrush to dampen the back of the shape and press onto the quilt. I found it looked best when each square had some type of detail. Pipe white balls, using a standard round tip and pastry bags and the leftover buttercream icing, around the bottom edge of the cake. Top with any kind of baby ornament. I used blocks that I found at a party supply store. I used a very basic but good vanilla cake recipe. 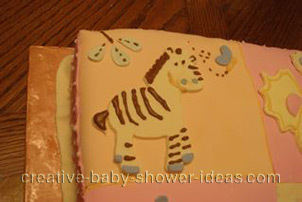 The cake was then covered in vanilla buttercream icing and fondant. 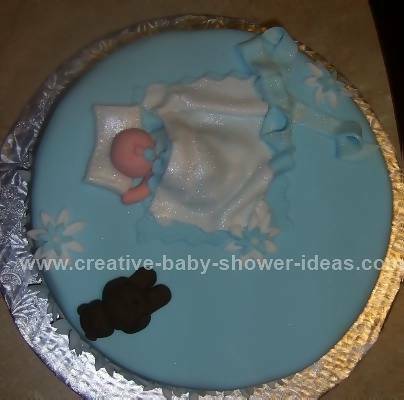 The decorations are also made using fondant and Wilton food coloring. I used fondant and did the quilted look using a cutter/embosser tool and a ruler. I used tip 87 to do the ruffle look and used sugar pearls. Extended fondant made cake, with chocolate and strawberry filling ... and decorated with frosting and gum paste. The fondant is made out of marshmallows. We (my sister and I) had to make an eggless cake for my cousin's baby shower. 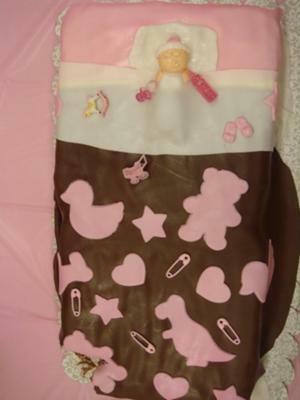 She is having a girl, and so we decided to bake a chocolate cake and decorate it as if it were a bed with a baby girl sleeping in it. I made the baby's face, hands, and toys out of fondant the day before. We made the blanket out of chocolate fondant. Hope you enjoy the pictures!